A few years ago I wrote about how everyone knows zoysia grows slower than bermuda, except when it doesn't. In particular, I was discussing the growth of the nuwan noi variety of manilagrass (Zoysia matrella) in tropical Southeast Asia. One of the examples I used in that post was the expansion rate for patches of nuwan noi in the bermudagrass fairways at the Santiburi Samui Country Club. I was back at Samui this week, and I went to the 18th hole to check the nuwan noi. Just around the dogleg, and down the hill near the landing area, there is a large patch of nuwan noi that has overgrown the bermuda. I paced it off, and the diameter of that particular patch is now 17 meters. 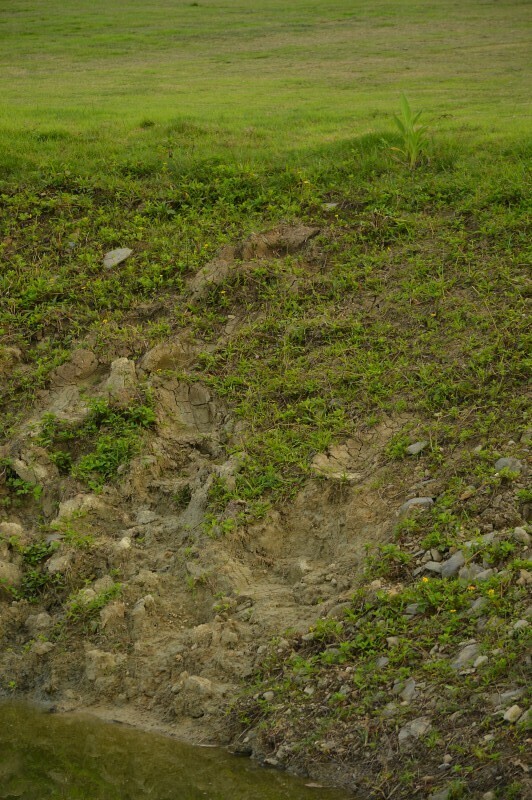 If that started as a single plant in January 2007, and has now grown 8.5 meters in every direction, then the expansion is 850 cm in 125 months, or 6.8 cm per month. This approximate rate keeps coming up in a number of measurements I've made. I have estimated the expansion at 7 to 8 cm per month. And in pot experiments, I get a similar rate too. For example, planting nuwan noi stolons at a rate of 1,500 nodes per square meter gives 1,500 nodes in 10,000 cm2. If each node occupies 1 cm2 at the start of the month, and then the coverage goes from 1,500 to 10,000 cm2 by the end of the month, that's an expansion rate of 6.7 cm2 for each plant in a month. Why does this matter? Because I've hypothesized that the most sustainable grass for a given location is the one that has the most growth per unit of N and per unit of H2O applied. What happens to the irrigation water requirement after changing the irrigation "rules"? 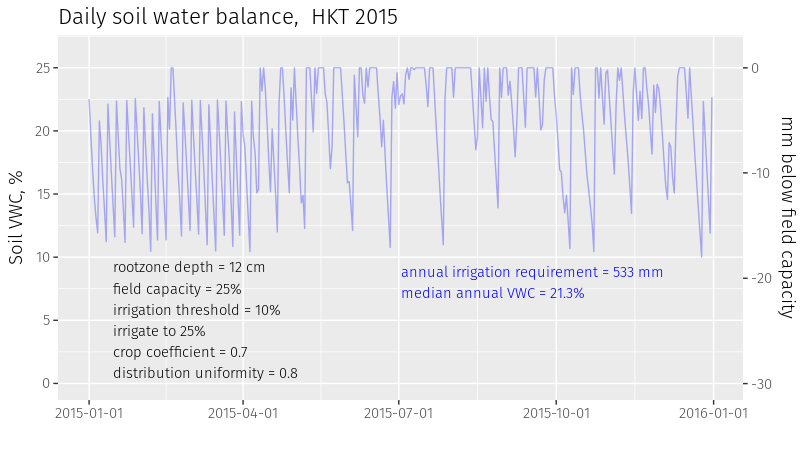 I've shown how calculation of the daily soil water balance, matched to precipitation data, can be used to estimate the irrigation water requirement for a given set of irrigation "rules." That is, if I calculate how much water is in the soil (details about the calculation method here), carefully adding in the amount added by rainfall, and subtracting the amounts lost to drainage or evapotranspiration, I can determine when and how much irrigation is required. And the irrigation rules are things like the quantity of water I will apply at each irrigation, the soil's field capacity, at what quantity of soil water will I reapply irrigation, the distribution uniformity of the irrigation system, and so on. The first set of calculations I showed were for a location in Bangkok. 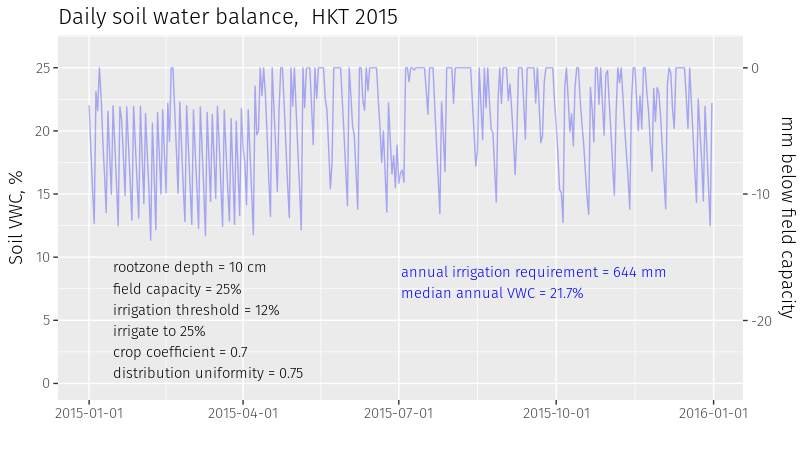 Now let's go south, to the island of Phuket, and look at the irrigation water requirement using weather data from recent years. I got the data from the Phuket International Airport (HKT), which is just north of Blue Canyon Country Club. I'll imagine that these calculations are for a hypothetical stand of turfgrass at that location. This is a view over the Canyon course looking north, with the control tower for HKT visible in the top left corner. Calculating the water balance for every day of the year with those conditions, the annual irrigation water requirement is 644 mm. That would be a classic deep and infrequent irrigation regime. For that same location and same weather data, what happens if I change to a light and frequent approach? Now I'll irrigate at 15%, rather than at 12%, but I will add only enough water at each irrigation to reach 20% VWC in the top 10 cm, rather than 25%. 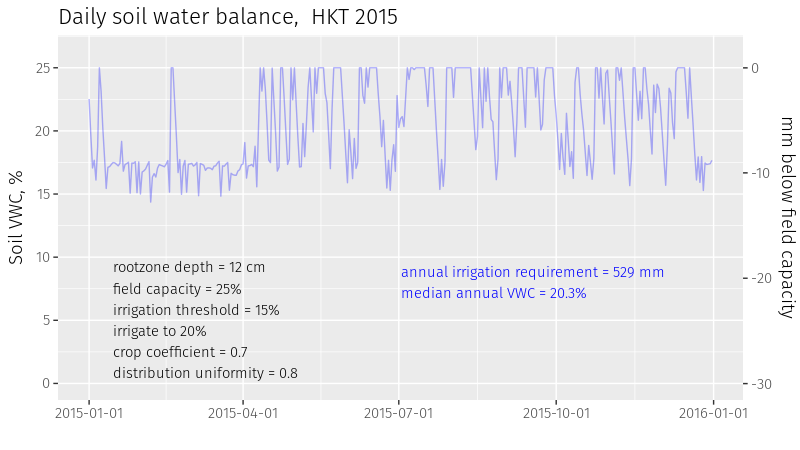 In this case, the annual irrigation requirement drops to 620 mm. What might happen if I start using a (or use an improved) soil surfactant? I could reasonably expect that the spatial variability in soil water content would be reduced, and that the soil would be easier to rewet after drying. I can go back to the original deep and infrequent rules, but now with the surfactant use I will let the irrigation threshold drop down to 10%, instead of the more conservative 12%. With the surfactant, I think that is a reasonable and safe adjustment. Now what happens? 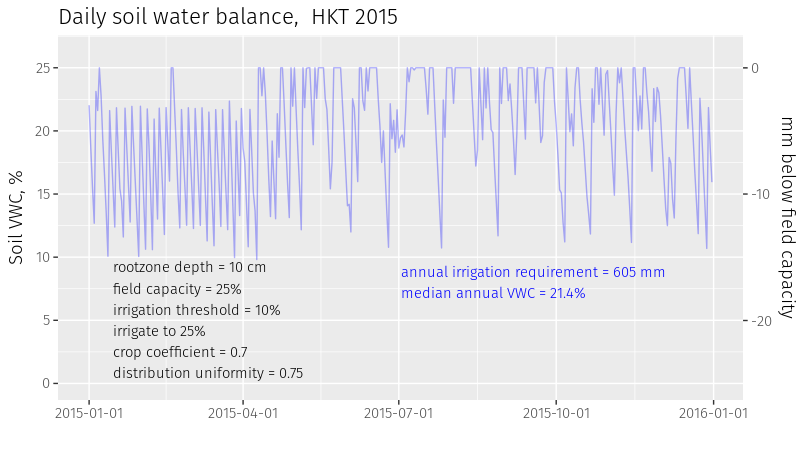 The irrigation water requirement drops from 644 mm to 605 mm. What happens if I can get the roots to grow a little deeper? If I then increase the rootzone depth from 10 cm to 12 cm, the irrigation water requirement goes from 620 mm down to 569 mm. Here's a way to make a substantial drop in the irrigation water requirement -- improve the distribution uniformity of the irrigation system. 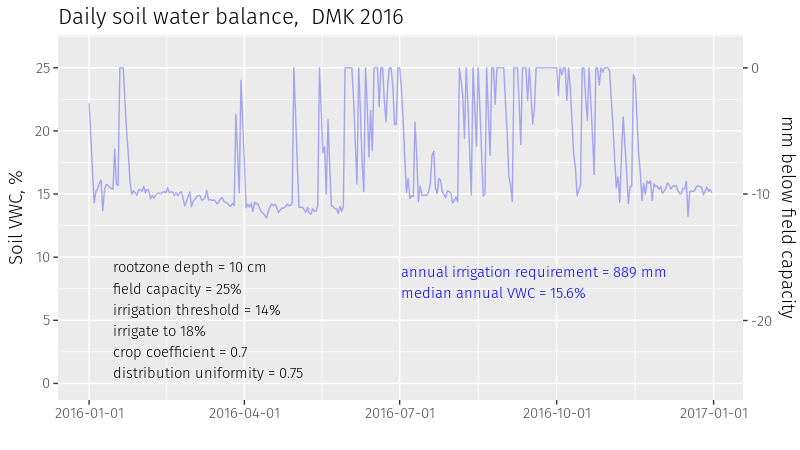 If I improve the DU from 0.75 to 0.8, while keeping the other rules as in the previous scenario, the irrigation water requirement goes from 569 mm to 533 mm. And if I then go back to frequent irrigation rules, in this case irrigating at 15% and adding water to increase the top 12 cm to 20%, the irrigation water requirement is 529 mm. Many of you will have seen the Kantarat Golf Course when flying into Bangkok. Maybe you've played it. 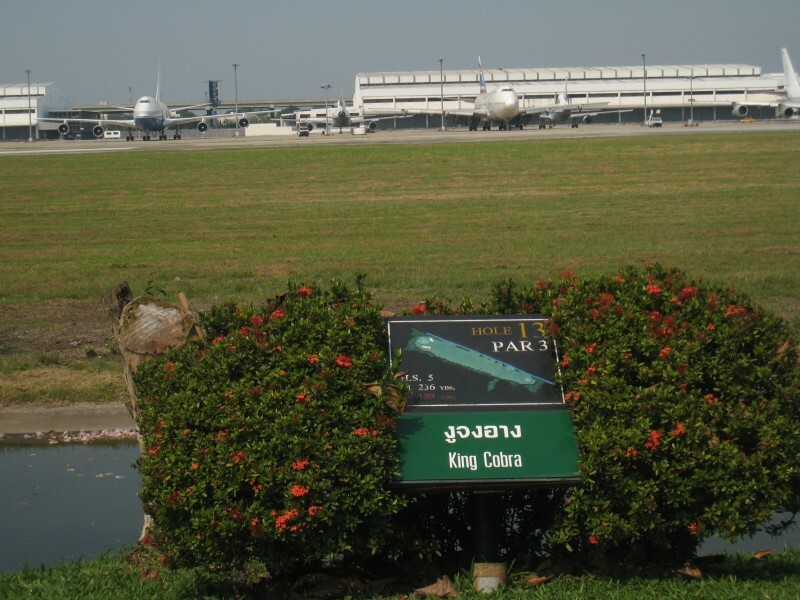 It's a cool course, set between the two runways at Don Mueang International Airport in Bangkok. It is commonly called the snake course, and I can confirm there are a lot of snakes out there. And then there are the planes, and the crossing of active taxiways. The most common problem with irrigation water quality is high salinity, and the solution to that problem is adjusting the quantity of water supplied. At the end of yesterday's seminar, I switched from talking about water quality, and discussed the application of the daily soil water balance in managing irrigation water quantity. I used the snake course as a hypothetical location, because I had a set of daily data from the weather station at Don Mueang (DMK). I've written previously about whether it is better to do deep and infrequent irrigation, or whether it might actually be better to irrigate frequently in small amounts. I applied the daily soil water balance to work through this for a location at DMK. Let's say we are growing grass at DMK and have a 10 cm rootzone depth and then the weather happens as it did every day at that location in 2015. I'll have some plan of how I'm going to irrigate, too. Let's say there is a field capacity of 25%, and I expect the grass may wilt when the volumetric water content (VWC) is less than 10%. I will try to irrigate to keep the soil from dropping below 12%, and every time I irrigate, I will fill the soil back to field capacity. When I do that, with the details as shown here, for example using a crop coefficient (Kc) of 0.7 and a lower quartile distribution uniformity (DULQ) of 0.75, I can then simulate the soil water content day by day through the year. I do that by stepping through each day of the year, with the evapotranspiration and precipitation as it happened, adding irrigation as required by the rules I've set. 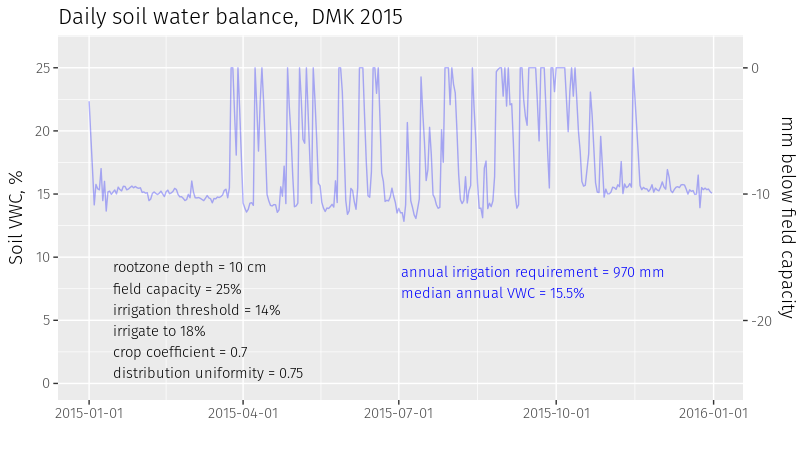 Doing that for 2015, the irrigation requirement is 1011 mm and the median VWC through the year is 19.7%. I can also simulate the soil water content and irrigation required for a different set of rules, but for the same soil and weather. 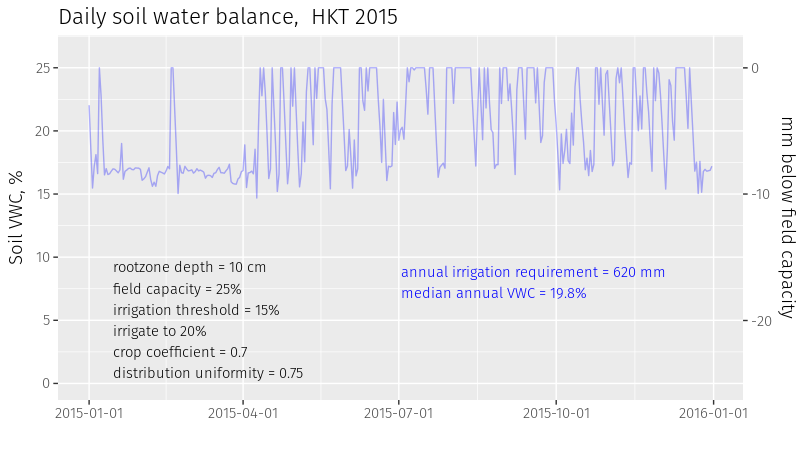 I did that, for those same 2015 weather data, now irrigating at 14% rather than at 12%, but instead of supplying enough water to raise the soil back to field capacity, I only add enough to increase the soil water to 18%. 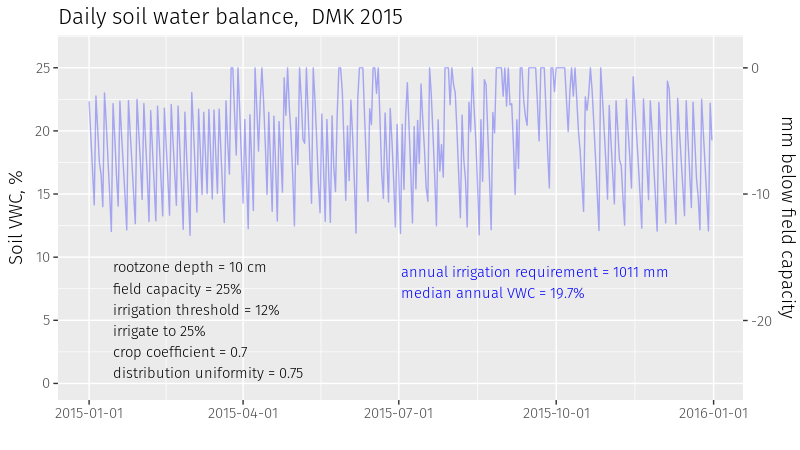 When I do this, the irrigation requirement drops to 970 mm, and the median VWC goes to 15.5%. 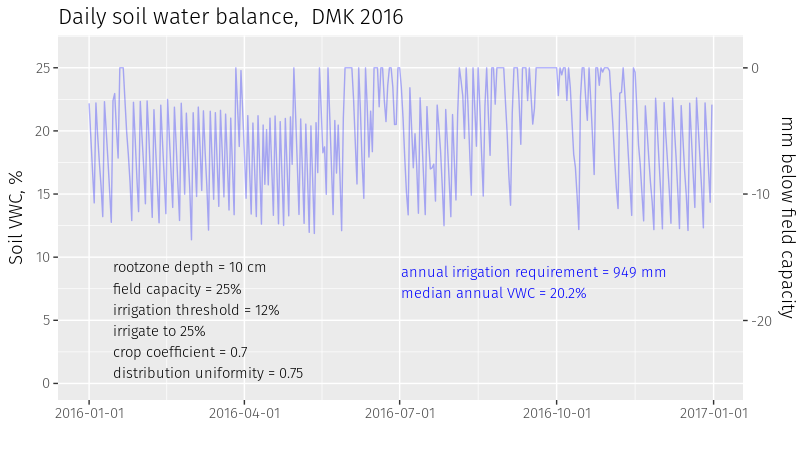 I checked this for 2016 data, and the results were similar: a total 949 mm of irrigation required and median VWC for the year of 20.2% using deep and infrequent rules, 889 mm irrigation and a median VWC of 15.6% with light and frequent irrigation. Yesterday I taught a seminar about irrigation water quality. Here are some links related to that presentation. How much water does a golf course need? That was the title of my presentation today at the Sustainable Turfgrass Management in Asia conference. See the slides here, or read the handout for this presentation here. I've been growing grasses in a plastic house with a lot of help from colleagues at the Thailand Institute of Scientific and Technological Research (TISTR). The idea was to see how these grasses grow in after being planted as stolons, and to see what happens when salt is added in the irrigation water. I'll be discussing this experiment at the field day in Chonburi next week. The picture above shows the grasses that receive the irrigation with 330 ppm total dissolved solids (TDS), 28 days after planting. The seashore paspalum looks the best, and the nuwan noi manilagrass has grown-in almost as fast. The hosoba korai, which is a beautiful grass once established, still hasn't covered much of the pot. Another thing I've found interesting is measurements of salinity in the soil with the new TDR-350. All the pots are supplied with the same quantity of water. But different sets of pots get different amounts of salt in the water. The soil salinity in these pots is changing depending on which irrigation water is applied. That's just as expected. For more about the TDR-350, see this webinar. "One aspect of golf that we never promote is the health aspect"
These pictures were taken 28 days apart. Here's what the grasses looked like yesterday, on February 24. That was 4 weeks, exactly 28 days after planting. For the first 10 days after planting, all the grasses were irrigated with 330 TDS (total dissolved solids, in units of ppm) water. For the next 18 days, the grasses shown above were irrigated with 4,500 TDS water. The planting rates for the stolons ranged from 99 g/m2 for the nuwan noi to 312 g/m2 for the yaa malay. This is the mean mass for the stolons planted in the pots. We cut the stolons into 10 segments with 3 nodes each and then weighed them and planted them; each 0.02 m2 pot was planted with 30 nodes (1,500 nodes per square meter). This is what the pots looked like immediately after planting, on January 27. I think this is interesting for two reasons. One, this gives some indication of the grow-in rate (and relative rates) of various grass varieties. Second, this shows the tolerance or not of the grasses to different salt levels in the water. One set of grasses is getting water with salt (TDS) at 330 ppm, the one pictured are getting 4,500 ppm, and another set are being irrigated with 9,000 ppm. I'll be talking about this, and showing some of these grasses, at the upcoming Sustainable Turfgrass Management in Asia conference. This was a new one to me. I saw the course laid out at the Ayutthaya Historical Park and thought it looked similar to Park Golf. But where Park Golf involves hitting the ball into a hole, a woodball hole is completed when the ball passes through a gate. This video explains the woodball rules. And these are the real ones this time, not the turf disease. 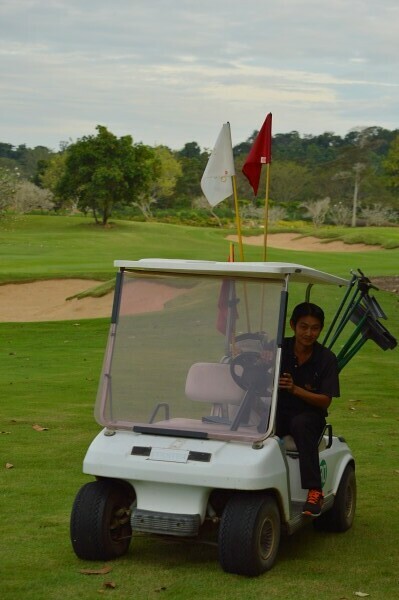 I was at Soi Dao Highland Golf Resort in Chanthaburi. This resort is surrounded by mountains near Khao Khitchakut National Park and Khao Soi Dao Wildlife Sanctuary. I asked, "are there any elephants here?" There weren't any, but I was told the count is 11 elephants living in the adjacent forests, and that the occasional elephant comes onto the course. Here are elephant footprints at the edge of a pond on the course. All the flags and all the rakes are collected each night to prevent elephants from playing with and breaking them. Apparently that was a problem in the past. 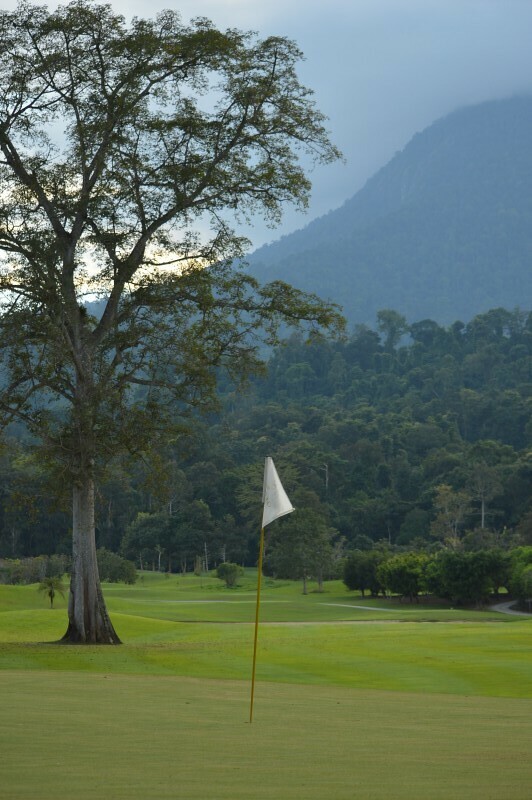 The course has impressive views and holes that border the forest and tropical mountain streams. The driving range is one of the best in Thailand. I wasn't sure if this was a driving range or a par 3 course. It could be both. For years I have been following the recommendations from soil testing laboratories trying to create the "ideal soil" with the correct ratios of nutrients. After each soil test I would follow the recommendations, most of the time adding more and more calcium. After each test my ppm values would increase along with the "target" ppm values which kept getting higher and higher until it seemed I would never reach it. I grew frustrated with the recommendations and after reading article after article and research papers online, I came across the MLSN guidelines produced by Pace Turf and Dr. Micah Woods. That's a new blog that I expect will be quite interesting to read. Now for my annual reminder of an excellent resource, the Golf course management blogging world site. This site aggregates blogs from around the world and shows the most recent updates at the top. The site administrators sometimes make manual updates to confirm the feeds are correct and the code is updated. I'm hoping they will do a refresh on the site again this winter to make sure all the feeds are active. And one more thing. If you are really wanting to read about turf, I have updated my last blog post about an eclectic reference list, so that each article or book that I cited now has a link to the item. I cited articles from 1859 until 2012, and you can get the full text of most of the items for free. Have a look, and see if you find anything interesting.